Mesothelioma is a type of cancer that develops in the tissue surrounding the lungs, the stomach, the testes, or the heart. One of the least common forms -- pericardial mesothelioma -- occurs in the thin lining that protects the heart, called the pericardium. Like other forms of mesothelioma, this cancer is attributed to asbestos exposure and is very difficult to diagnose. It is extremely rare, with only about 200 cases known to doctors, representing approximately 1% to 10% of all mesothelioma diagnoses. While treatment is challenging due to the disease's proximity to the heart, and there is no cure for mesothelioma, early diagnosis still gives patients the best chance to prolong their lives. We hope the information you find here will help you and your loved ones learn more about mesothelioma. It is important to speak with your doctor if you experience bothersome, persistent symptoms and have been exposed to asbestos. How Does Pericardial Mesothelioma Develop? It is believed that asbestos fibers that become lodged in the pericardium cause the development of pericardial mesothelioma. When these dust-like fibers are inhaled, they may travel to the heart through the bloodstream, and the body then struggles to eliminate them. Over time -- as many as 10 to 60 years -- these fibers can cause changes in the cells of the pericardium, which may lead to the growth of cancerous tumors. Asbestos is a group of minerals that occur naturally in rock and soil. Exposure to asbestos can occur anywhere, such as the home, workplace or school. However, most patients diagnosed with mesothelioma worked in the manufacturing of products that contain asbestos, or used these products in their occupation. In some cases, family members of those who were exposed to asbestos in their work have developed mesothelioma. This may have been the result of asbestos dust being brought into the home on the workers' clothing. Because it is exceptionally strong and heat resistant, asbestos has been used extensively in construction materials such as insulation, roofing shingles, cement and flooring products. It can also be found in brake and clutch linings, heat-resistant fabrics, gaskets and coatings. Asbestos has been used by the U.S. military and in many shipyards as well. Experiencing some of these symptoms does not necessarily mean someone has mesothelioma; only a doctor can make such a diagnosis through extensive testing. To reach a diagnosis of pericardial mesothelioma, a doctor may start by reviewing the patient's medical history and completing a physical exam to determine if further tests are necessary. If you visit your doctor with concerns about symptoms you are experiencing, it is important to mention if you have been exposed to asbestos. When further tests are needed, the next step may be to take an image of the heart, which might include x-rays, a CT scan or a PET scan. These images are helpful in detecting tumors or fluid buildup; however, a fluid or tissue sample is usually required to make a definitive diagnosis of mesothelioma. At this time, there is no cure for pericardial mesothelioma; however, treatment of the disease may prolong an individual's life and relieve symptoms. Surgery to remove tumors may be an option for patients diagnosed in the early stages of this cancer, and symptoms may be alleviated by a procedure called a pericardiocentesis to remove excess fluid from the area around the heart. Radiation, chemotherapy and medication may also be used to help reduce symptoms and provide for a higher quality of life for pericardial mesothelioma patients. 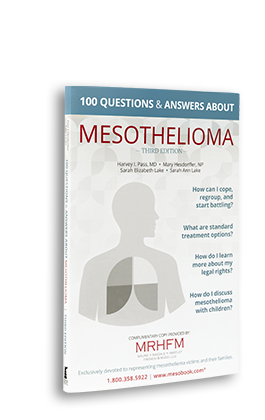 You can learn more by requesting a free, no obligation copy of "100 Questions & Answers About Mesothelioma." This book is devoted to providing treatment information for those diagnosed with mesothelioma. To order your copy, simply CLICK HERE or call us at 800.300.2919.